Seeing the origin of a false claim from its very beginning gives insight into where they come from. Contentious topics have many claims online, many completely untrue. Knowing how false claims arise might help us resolve them. It’s also a reminder if you see a claim, especially an emotive one, it pays to check first. Here’s one from people projecting something they oppose onto a straight-forward, accurate information source. They didn’t ‘misinterpret’ something complex, they put their projection on something that had emotional resonance. Let’s have a closer look. Some people say the deer developed these fibromas from eating plants sprayed with glyphosate. Not true, not at all; more on that later. How did this claim come about? When I first started checking claims tracing them back to the original online source it was relatively easy, if time-consuming. Modern over-simplified search tools now make it hard to do. In this case the original source is plain. It’s a public post by Your Wild Ohio – Hunter. The source is even named in the image. It’s also easily confirmed using a reverse image search. So, no mystery there. There is no mention of Monsanto, glyphosate or RoundUp in the original post. None. The full contents of the original post; no mention of glyphosate, Monsanto or similar. But—apropos of nothing—some comments attribute it to glyphosate or Roundup. These claims are evidence-free. They’re also despite that it’d take very little to check what causes these fibromas. It looks to be free projection of stuff rattling around in some writer’s heads onto the image. I’d also guess they didn’t bother read the article, or the other comments. A few souls corrected the misplaced ideas, but that doesn’t seem to have had much effect. 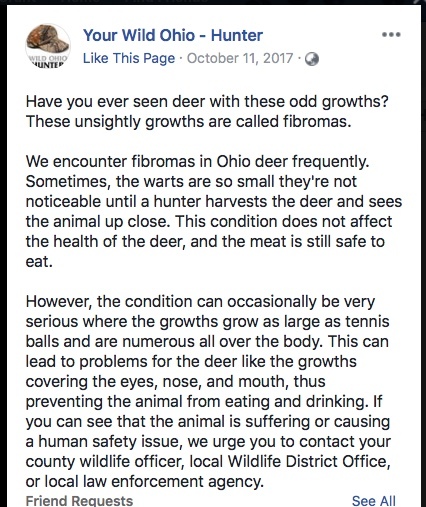 Besides the original post there are other sources of information such as the Pennsylvania Game Commission page on fibromas, and wikipedia. Fibromas are benign growths. Other species get fibromas, including us humans. You’ll see some examples in the PGC’s page. Squirrels, rabbits, and so on. The deer infection is specific to deer. The stuff of populist-driven hatred? 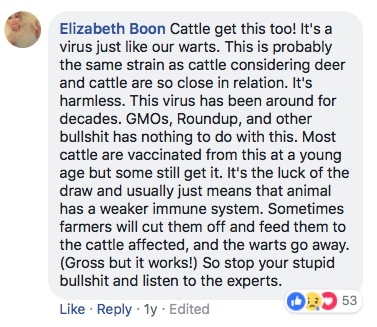 My early days of checking vaccine claims often traced them to bizarre conspiracy pages. Many original pages were so bizarre that few would take them seriously. Some mixed claims involving Nazis, Jews, massive government conspiracies, and more. Even bizarre sexual practices. The claims spread from someone ‘translating’ the page, stripping out the worst strangeness. Who does that? Once the weirdness was gone, the claim was free to spread. Here, the original source is absolutely fine. It feels as if something has changed, at least for a few people. People wanting to put hatreds others have encouraged onto innocent things. Everything that looks ‘wrong’ ‘must’ be the work of your chosen enemy. In this case, this enemy is the company Monsanto. Monsanto later developed ‘Roundup-ready’ plant varieties tolerant of Roundup. GMOs offer many opportunities beside herbicide tolerance. Glyphosate has long being out of patent, and is now used in herbicides made by many companies. Despite this protest focuses on the straw man. Those newer to the topic may not realise the roots of this. It’s not a scientific concern about glyphosate. It’s straw-man labels (‘Monsanto’) to rail against that originate in opposition to GMOs. An upshot is demonising innocent things. 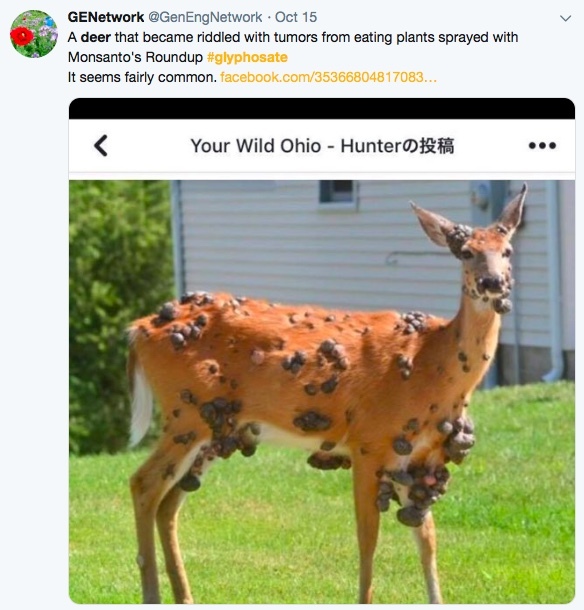 In this case both Roundup—which has nothing to do with this—and the deers’ infection. In my experience these have nothing to do with science. More for another day, perhaps (but you’re welcome to add thoughts in the comments). If true it’s an interesting practice. While I’m here, the particular virus is apparently specific to deer, and won’t infect cattle or sheep. Transmission between deer is thought to be via insect bites. Other sources suggest surface wounds may be a contributing factor. 3. My usual caveat for Wikipedia is if you wish to be cautious to use it as a starting point, ‘to be confirmed’. In this case I’ve run into the entry from more detailed sources that the entry cites. 4. There is also Agent Orange in the background. This might have made people more readily ‘jump on’ Monsanto, but my impression is that this a much lesser player in the current fuss than opposition to GMOs. A foil to the populist scourge: towards a Science Commission for New Zealand? The featured image is the photo as originally shown on the Your Wild Ohio Facebook page. The other photos in the articles are from Facebook and Twitter. Would you mind explaining how you use reverse image search to find the original picture? If you place your mouse over the little camera on the right-hand side of the search box, it’ll say “Search by image”. If you click on the camera icon it’ll bring up options to either search from the URL (web address) of the image, or for you to load up a file of the image from your device. Bear in mind that some pages can’t be searched into, like closed Facebook groups, and that some web locations try “hide” that they’re holding an image. I could write a few posts on ‘tech tips’, which once in a very long time I do. They’re not really ‘science’ (this is a science blog forum…), but tech sort-of, kind-of fits…?? Then again: too many ideas, and not enough time! If you right-click an image you should get options to either copy the image address or to copy (or save) the image itself. You can try this on the image on the top of my post for example.